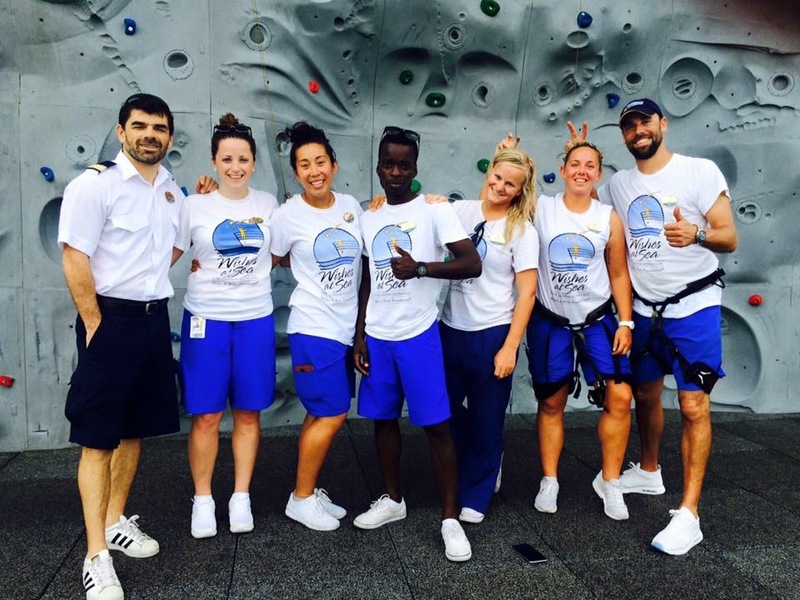 Helen gives her thoughts and advice from working multiple contracts with Royal Caribbean. After graduating from University, I worked for a charity in an office environment which I absolutely loved and enjoyed being at home with friends and family. However, I have always wanted to travel, explore and meet others from around the world but I didn’t have the money to go backpacking the way I would want to and was in a little bit of debt as a result of living away from home to study. So through the powers of google, I started to look for jobs that enabled me to earn whilst experiencing new places, never did I expect to see the position Sports Staff on a cruise ship! Boom! I applied straight away and I knew I really wanted the job because I sent a personalised email and changed my CV so it was relevant to this specific position. A lot of people I know decide to do it straight out of University which isn’t a bad idea, especially if you don’t have anything set in stone. Like any job, you need to give the organisation details about yourself, and with Kings Recruit it was easy, I just had to complete my profile which I did simply using my CV and adding bits in I thought were relevant when needed. The quicker you complete this process, the sooner you could be placed. I don’t like having a lot on my to do list anyway so as soon as I had the chance to fill in all the forms, I did. It’s also best to keep everything organised because there’s a likely chance you’ll need to access all forms at a later date. One thing that did go through my mind was ‘is this legit?’ especially when you have to pay out for your medical (need to do this with most jobs abroad) and although I did believe it was, I double checked the charity commission to make sure Kings was registered as well as Royal Caribbean’s recruiters list. Visa – You should get this refunded so keep your receipts! Take photos of those receipts! When you are on your ship give them to the financial office within 28 days to get your pennies back! Gateway City form – basically means what airport you want to leave from/return to. It doesn’t include all airports, mainly the big international ones so double check before! Interview with Royal – Last part is to speak to someone from Royal Caribbean! It literally lasts 5 minutes, and don’t worry if they are a few minutes late, they are busy people! Yay you’ve been offered the job! BUT this doesn’t mean you are going tomorrow so just chillllll, it means that they are happy to place you on a ship… if there is a spot available! You’ll know because you will be sent a letter of employment (LOE). Everyone on ships gets this whether you’re a new hire or a returner. It has information including what ship you are on (then google the itinerary so you know what places you are going to!) and your sign on and sign off date. Nearer the time you will get details about what Hotel you are staying in and transport will be arranged to take you there in the evening, and then to the ship in the morning. Apart from the obvious, there are a few things I suggest you bringing, things you wouldn’t necessarily think of until you are on the ship. White trainers (recommend 2 pairs and try not to spend a lot of money, they will go dirty quickly). White socks – a lot! Can be trainer socks or even long ones with logos on it. Heels (ladies) – Royal aren’t that strict when it comes to heel height so bring what you want and like, I’d suggest at least 2 with one black pair. Smart casual clothing – In the evening after 6pm, if you want to go around the ship or have work (dress codes apply on all ships so you will know what night is what), you are required to be smart/casual which basically means nothing too revealing, something you could go to an interview in and look nice in – you don’t want to bring attention to yourself! Black clothing – There may be duties you need to do in the evening that require you to wear all black, same concept as smart casual. Long dresses (ladies) – formal nights will mean you need to where dresses/gowns that are full length – bring at least 2. Tux/Bow tie (gents) – same as above, you can get away with a nice suit. Any other stuff you would bring on a holiday for when you visit the ports, hoodies/comfy clothing for when chilling in your cabin (can be quite chilly!) and casual clothes for when you go to the crew bar. Shaver (gents) – bring an actual shaver, not a beard trimmer! Gym clothing – you are lucky enough to use the guest gym which is really good! Playstation/Nintendo – all rooms have a tv and it can be refreshing to have the option to switch off from work and just have a bit of play time. Dryer sheets (£1 from asda!) to make sure your clothes smell nice after being washed and if you want to put them in your drawers to keep that fresh smell! Going over a holiday like Halloween/Christmas? – Bring those fancy dress clothes you have had for ages! Day uniform – Can only be purchased from Royal as it is branded. This will consist of a polo top (recommend at least 2), shorts and a tracksuit. For gangway shifts you will need to purchase a polo shirt/jacket and smart shorts/trousers on the ship. If you are going somewhere hot like the Caribbean for your contract I wouldn’t bother purchasing the trousers/jackets etc. If you decide later you want one, you can always get it then. Before purchasing anything, always ask your team if there are any spares to save you spending money! Evening uniform – On the bigger ships you will need to wear ‘dress blues’. This is usually for the first day of the cruise and includes a blue suit (skirt/trousers and blazer for the ladies) which you can buy yourself so you know it fits well but can also get on the ship. Clothes to go with these can only be purchased on the ship which include a yellow top for the ladies and shirt and yellow tie for the gents. Smart black shoes are needed, best to bring your own! Swim/Flowrider gear – will be provided for you on the ship, you should be given these free but may need to buy black board shorts (sports staff) if they don’t have any for the flowrider, if the ship has a flowrider. Some will say try and squeeze everything into one bag which makes it easier when going to/from your ship, but some will say that you get 2 bags included with your flight (always double check!) so make the most of it – choice is yours! It is normal to be nervous/excited but if there is one thing I know for certain, it’s that the people in your team and generally just all staff are so friendly and amazing. Yes, it will take time to learn everyone’s names, know your way around the ship, and know your job responsibilities but embrace it, it is normal for it to take around 2 weeks to properly settle. Also, all ships have legal responsibilities to keep in line with, training being a big one ensuring all crew know what to do in certain situations and are aware of all possible situations. So as soon as you step on the ship, I guarantee you will have training on your first day, followed by training for the next 2 weeks. They do have a lot to get through and you will also be trained in your own areas. Use this time to get to know others in training, it will never be just you as people are always coming/leaving the ship and training certificates have to be renewed every year. When you have finished your training, go and explore! Walk around so you can get to know your home better and if you’re tired, take a nap, you won’t have the chance to do it as often once training is over. Even though you may feel like you’re not doing what you applied to do when you first get there, don’t worry you will, and you will eventually be with your team every single day living the life of a crew member! Work hard, play hard. It’s as simple as that, you do work every day (although some days it’s only a couple of hours) and it depends on what ship you are on, but when it’s time to get off and be a tourist or go out to the crew bar, you work just as much, if not harder! It is important to get that balance, and life is incredibly easy for us, all you really need to do is ensure your cabin is clean and do your laundry now and again. The lifestyle is incredibly unique, there is no other job environment like it. It all depends on who you are, what your goals are and how you make the most of it. It hasn’t been that long for me since I left Harmony of the Seas, and although I loved working on ships, it is an easy lifestyle choice where as I am looking to explore the world on my own terms and find things that truly challenge me. On the ship you will get a ‘salary@sea’ card which is a debit card. You get paid every 2 weeks in dollars tax free, can do one free cash withdrawal every 2 weeks and can transfer money home automatically. You can either get cash out to top up your crew card to pay for coffee/drinks/restaurants etc. or you can link it to your ‘salary@sea’ so you never have to think about it. Should I take money with me? I recommend taking at least $300 so you can go to the bar or buy things on the ship if you want to until you get paid. Do I need to take my laptop/mac? I’ve always taken mine but it really depends on what you are going to use it for. If you want it for photos/videos/films then yes bring it but if you are only going to use it for when you have wifi and can do the same things on your phone then think twice about it!